Some may find it hard to understand that friendship can be found in any species… I’m here to tell you that it can. I love X-Man as I love anyone… with all my heart. This is my friend from work, X-Man. I met X-Man a little over a year ago when I started working at VINE Sanctuary. 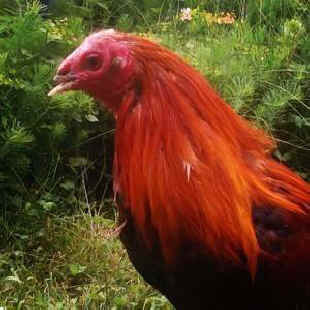 He had been rescued from a cockfighting ring and rehabbed at our sanctuary many years ago. He was finally living a life free from pain and torture, and he was loving life. X-Man was mostly a solitary guy, a free roamer who chose to chill in his own part of the gardens with his hen friend of the moment. He always had a hen or two hanging around with him. I felt a connection to X-Man from the moment we met. We became very good friends. X-Man knew by the sound of my car when I would be coming through the gate, and he would always be waiting for me when I came through. Our greetings were always the same: I’d scoop him up, and snuggle him close. He’d tuck his head under my chin while making the happy sounds roosters make. I’d kiss him on the head and give his favorite spot under his wing some good scratching. I looked forward to those moments every day… I think he did too. X-Man never failed to put a smile on my face. I will never forget the comfort he gave me when I thought none could be found. Some may find it hard to understand that friendship can be found in any species… I’m here to tell you that it can. I love X-Man as I love anyone… with all my heart. X-Man passed away the other day surrounded by his other friends. I wish I could’ve been there to say good bye… hold him one more time… tell him why I think he was the best of roosters. I know how lucky he was to be saved from the fate about to befall him when he was saved from cockfighting. I’m glad that he lived out his days in freedom at the sanctuary never having to fight again, never knowing hunger or thirst again, and always having safe, clean, warm, shelter…. I just wish he could’ve enjoyed that life a bit longer. I will never forget you, X-Man. Thank you for being my friend. Danielle is a full-time animal caregiver, with an emphasis on bird care, here at VINE. This is her first contribution to the VINE blog.